Champions and Winners of the Weekend in Sports! The Commonwealth Games down under have come to an end and Jamaica did extremely well, winning International medals that we have never won before. Over the weekend, we took over some of the Field events! Jamaica’s thrower, Danniel Thomas struck Gold in the Women’s Shot Put! Fedrick Dacres and Traves Smikle brought home the Gold and Silver respectively for the Men’s Discus. Back on the track, Paralympian, Tevaughn Thomas won Bronze in the Men’s T47 100m! Natoya Goule finally medalled internationally with a Personal Best in the Women’s 800m Final with a sweet Bronze medal finish. Danielle Williams and Yanique Thompson got Jamaica a Silver and Bronze respectively in the Women’s 110m Hurdles. Jamaica also took home medals in the 4×400m Relays for both the Men and Women! The NBA Playoffs started last Saturday and the Celtics are already 1 up on the Bucks and the Thunder 1 up on the Jazz. Warriors blew out the Spurs and the 76ers routed the Heat. The Raptors finally won an opening Game 1 in the Playoffs, beating the Wizards. The no. 1 team in the West, the Rockets, had a fight to beat the Timberwolves, 104-101. This may be one of the best match ups for the West in the 1st round. The Cavs lost to the Pacers 80-98. But if you think about it, LeBron James usually allows a Game 1 loss. Pelicans beat the Trail Blazers, 97-95. They had a significant lead for most of the game and when the Trail Blazers came fighting back it just wasn’t enough. After Manchester United lost to West Brom over the weekend, Manchester City officially became Champions of the Premier League! It’s Man City’s 1st title under Pep Guardiola. Congrats to them. More exciting weeks ahead in Sports. Stay tuned! The West Indies Under 19 Cricket Team won the ICC World Cup vs India! Signs of a good future? Maybe not. They only scored 146 runs in 49.3 overs to win, however the bowling and fielding were impressive. It is the first major title on any level that the West Indies has won since the senior team won the ICC World Twenty20 in 2012. Arsenal put a dagger in Leicester’s campaign to win the Barclay’s Premier League title yesterday with Welbeck’s header in stoppage time to seal a 2-1 victory. Leicester’s only goal was from a penalty kick at the end of the first half that probably shouldn’t have been awarded. They got a red card at 54′ downsizing them to 10 men, then Walcott of Arsenal equalised at 70′. There was exciting action in La Liga yesterday too. Lionel Messi had an unbelievable Penalty kick, where it was Barcelona 6-1 Celta Vigo! Watch it here! Zach LaVine and Aaron Gordon put on a show for the Slam Dunk Contest! Zach LaVine reclaimed his title from last year with all 10s. Klay Thompson defeated Splash brother, Steph Curry with 27 points in the final round to win the All Star Weekend 3-point shoot out competition. Thompson tied Curry’s score of 27 last year for the most points ever in the All Star 3-point shoot out competition. The West beat the East, 196-173 with the record for the most points in a half, 92 and both sides surpassed the record for the most combined points in a half, 92-90. Russell Westbrook got MVP for the 2nd straight year with 31 points. Paul George of Pacers was on fire with 41 points, just 1 point shy of Wilt Chamberlain’s record of 42 for the most points scored in an NBA All-Star game. Paul George also had the most 3-pointers in the game with 9. This was also Kobe Bryant’s last All-Star game. All the greats were there to watch including the Greatest of all time, Michael Jordan a.k.a MJ. The commentator confirmed it saying, he IS still the greatest of all time. MJ sent his best wishes to Kobe. The other ‘MJ’, Majic Johnson also did a tribute. Kobe follows the 2 MJs with his level of skill and greatness. Kobe we salute you! 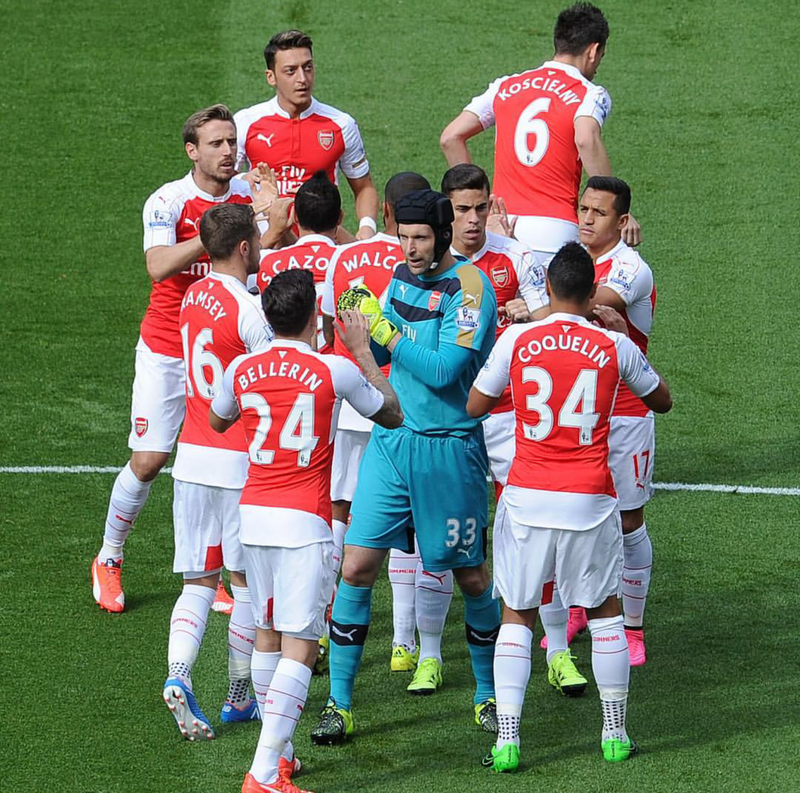 Arsenal’s 2-1 victory over Manchester City yesterday strengthens their beliefs that they could win the BPL title. The Weekend in Sports! US Open Finals, Mayweather retires & more! Suga called it! Congratulations to Flavia Pennetta and Novak Djokovic, the 2015 US Open Champions! The more experienced, Pennetta won her first singles Grand Slam title on Saturday in 2 sets, 7-6, 6-2, defeating the woman responsible for the upset of the year, Roberta Vince. The Men’s Final with World no. 1, Novak Djokovic vs no. 2, Roger Federer was delayed by 3 hours because of rain but definitely worth the wait. Note that there will be no more delays next year because there will be indoor options. Djokovic has won his 10th Grand Slam title and 2nd US Open. 3 this year except for the French, where he was a finalist! Amazing season. He won physically and mentally with the crowd against him in 4 sets, 6-4, 5-7, 6-4, 6-4. Well deserved. The match was epic! Both players were a bit nervous in the first set. Djokovic was the more relaxed player, but had a nasty fall in one of the early games, then lost his momentum. He got it back and played well to win the first set, where Federer was very tight. The commentators said it was a messy first set for Roger. Roger looked more like himself in the 2nd set, using a lot of variety to even sets, 7-5. That set was an hour long! Djokovic regained control and took the 3rd. In the 4th set, Djokovic was up 5-2 to serve for the match, but Roger wasn’t finished just yet. Roger broke his serve and held for it to go to 5-4. Djokovic had some big serves in the last game and after 3 hours and 20 minutes, Djokovic hit a massive serve that Roger sent long to seal the deal for Djoko. Roger is clearly the People’s Champion. Djoko had to hit deep to win most rallies or serve big to win points. A few well executed lobs worked in his favour as well. Roger said he is very pleased with where his game is at and we will see him next year. After losing the 1st set, he was already at a disadvantage to make up physically in the 2nd, then try to overcome the excellence of Djokovic in the 3rd at his age and current fitness level. He looked fitter than Wimbledon but he has more work to do. Kudos to him though for helping to make the match so entertaining. You know it was epic when Djoko jumped up into the stands afterwards and shouted, ‘This is Spaaaaarta!’ with members of his box. Suga thinks this is probably his best and most meaningful win of his career so far. 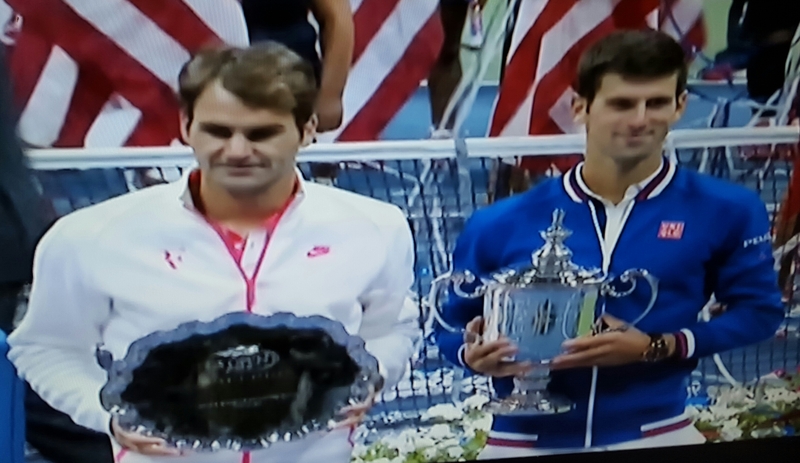 Well done Djoko. Floyd ‘Money’ Mayweather has hung up his boxing gloves, going out with a win by a unanimous vote over Andre Berto to retire undefeated 49-0. It was a good fight. Much more entertaining than the most hyped and marketed fight in history, the Mayweather-Pacquiao fight earlier this year. Props to the referee for denying Mayweather Barney hugs and there was less running, but more dancing. No joke. Mayweather actually did the running man during one of the rounds. He enjoyed himself. He displayed his quickness and agility off the ropes, as he is known for. Besides a very low, direct blow to Mayweather from Berto (for all the abused women out there! ), it was a fairly clean fight. Finally we saw some upper cuts! Yes! Both boxers lost their footing during the fight, but it was in the last round that Mayweather piled on the right hooks and upper cuts, weakening the knees of Berto. But Berto recovered quickly and put up a good fight. What did Mayweather and Berto say after the match? Well Mayweather explained why he was retiring. He said he is almost 40, been fighting for 19 years and has been a World Champion for 18 years. He believes he has accomplished everything, having broken every record there is, so there is not much left in the sport of Boxing for him. He is happy to leave the sport with all his faculties, something he has mentioned before, that clearly was a concern for him. He also mentioned that he has done a lot of charity work, which the media never mentions, for instance, feeding the homeless. He of course closed with, ‘Money don’t make me, I make money. I am the best at boxing’. 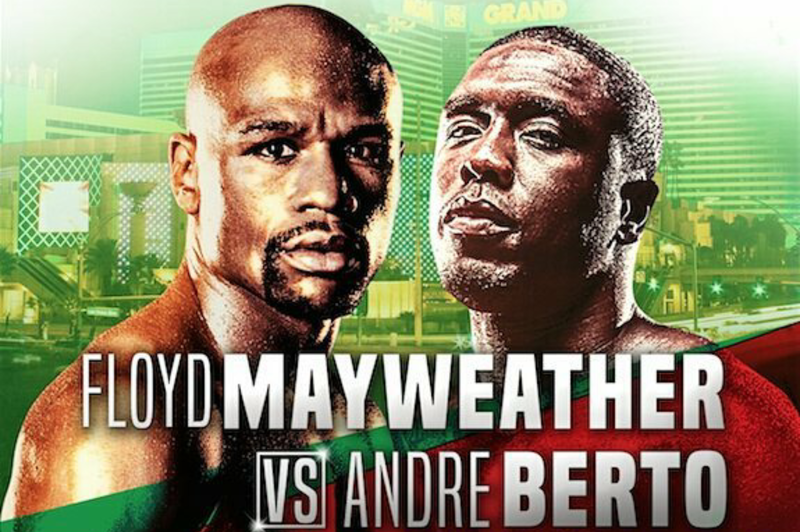 The defeated, Andre Berto said Mayweather was slippery. He had a lot of speed and was real crafty, using a lot of little things to keep him off his rhythm. He was asked about an exchange between them during one of the rounds and Berto explained that he basically said, ‘Here I come. I am here to fight.’ Berto said he pushed it to the limit but he fell short. He was asked if he thought Mayweather was the best ever. There was a pause and unclear shout from the crowd. Thankfully he kept it real and said Mayweather is ONE OF the best ever. It’s not looking like a good year for Chelsea. 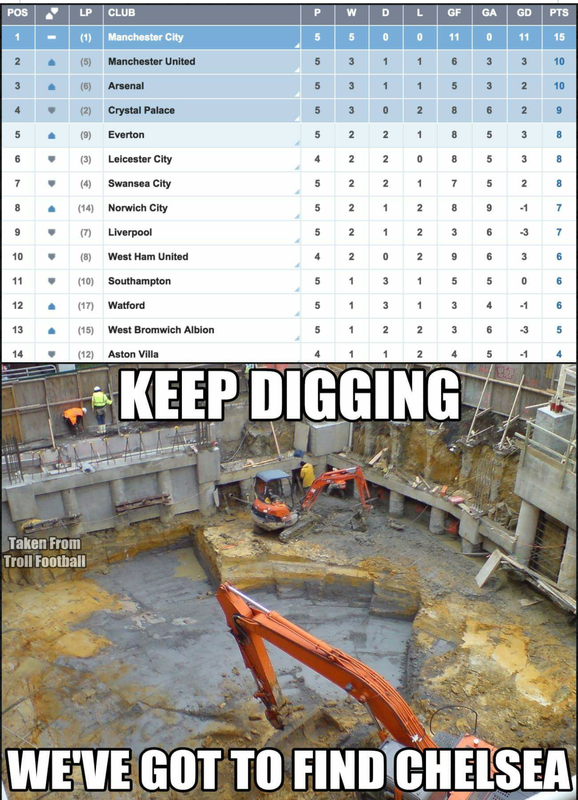 They continue to dig a deeper hole with a 3-1 loss to Everton. The other big sides, Arsenal, Manchester City and Manchester United were all victorious. Arsenal with a 2-0 win over Stoke City, Man City beat Crystal Palace 1-0 and Manchester United beat Liverpool 3-1!